They call this day Memorial Day. The Doughboy at its original location in Garfield Park, 1939. He who loved life had found death his prize. While the rain beat down on the Earth. Till Memorial Day comes around again. The statue of him who had died for me. And the rain beat again with a steady pound. And the rain beat down with a steady beat. And bewilderment as when he died. I thought he must be alive again. Was there none to honor him once again? How could the world have forgotten him so? While Earth gathered him in. One should honour him once again. 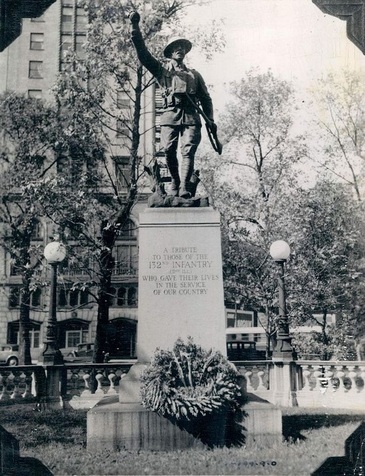 The statue of him who had bravely died. I’m sure he was glad I remembered his shrine. That one should remember Memorial Day.